I am in the process of designing a dolly to be used in moving Linotype/Intertype machines. Looking for any details as far as overall dimensions of the feet and bolt holes on these machines.I have dimensions on the later model 5 and model 31, but nothing on Intertype. My goal is make a dolly that will work with any Linotype/Intertype model. Hopefully the dolly will make transport of these jewels easier and with less chance of a upset. 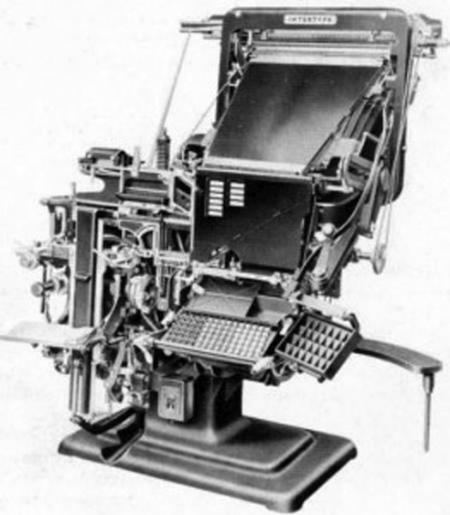 There is a good chance that I will be adding another Linotype to the “Old Iron Rest Home”. You can never have too many Linotypes! Good to hear! I’m at max capacity, so my rescuing days are over, I think. Max Capacity Never heard of that, just build another wing on the Old Iron Retirement Home. Later Intertypes had a quite different style of base: rectangular rather than “star” shaped. They termed it the “Universal” or “streamlined” base. The dimensions of this base on an Intertype model C-4 are 43 1/4 inches wide by 30 inches deep (+/- about 1/4 inch for each dimension). 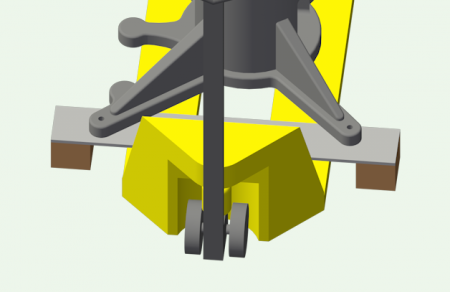 There are no holes for anchoring bolts in this style of base, so if you wish your dolly to contribute to the stability of the machine, you’ll have to figure some way of binding the base to the dolly. A few weeks back I was thinking about moving Linotypes in the context of shuffling 3 linotypes around in a limited amount of space. 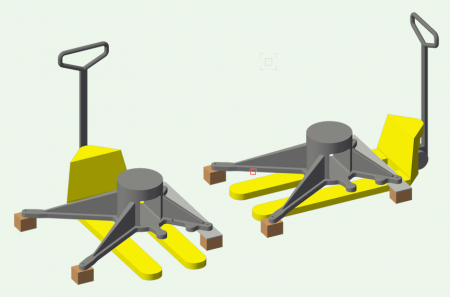 I currently have my machines on skids and use a pallet jack to move them around, but that means I can only ‘pick’ them from the front or back, which can be problematic. I’m planning on swapping the skids for blocks under the end of each leg, which will be more than stable enough for shuffling around a flat concrete floor. On the short leg side, the ends of the legs are roughly 25 inches between the bolt holes, and a standard narrow pallet jack is 20.5” wide. With the machine on 5” square blocks, I end up with no room between the blocks for the pallet jack, and even if I fudge the numbers to make room, I still end up with a slot that is so narrow that I have to approach it dead-on with the pallet jack, which isn’t always possible. My plan is to put a piece of 3/8” steel on top of the blocks on that side of the machine, which will allow me to offset the blocks just enough to give the pallet jack some wiggle room. Way back when the newspaper I worked at got rid of their linotypes they had riggers come in and they had these little things that looked like the treads on tanks, each machine was lifted and one of these was placed under each leg, the machines could be moved in any direction with ease, there is a name for these things but I can’t remember it. they were only a inch or two high. I have a set of 4 of the skates that you are talking about. My goal is to make a “dolly” that is modular and very adaptable. Depending on the weight and surface involved it will either use the skates or casters. Perhaps you’re thinking of Hillman rollers?